As Spiritual Beings, we grow in many ways. The intellect is fed by logic, the heart is fed by music and story. The Center for Spiritual Living seeks to feed all aspects of your nature...with teachings that speak both to your left brain by their very scientific basis and to your right brain by how they touch your soul. Our classes and Sunday services include an ample helping of both. We offer opportunities to renew minds through a diverse and captivating selection of classes. These include not only Science of Mind teachings but also a broad range of subjects that we offer by means of coaches, spiritual teachers, and guest speakers who give enlightening and transforming workshops and programs. Newcomer classes are offered on a periodic basis. Stayed tuned for next class schedule. 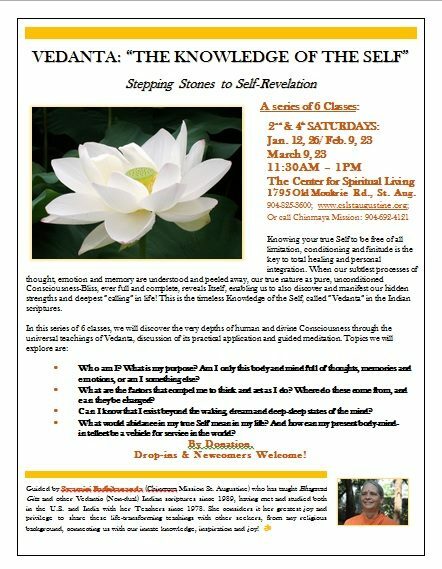 This class is usually offered every other month on the first and second Sundays of the month, from 11:30 - 1:00 pm.